The Ibama environmental protection agency estimated the collapse had released a million tons of water and mud, according to Estadao newspaper. A dam collapsed in southeast Brazil today, unleashing a torrent of mud that was feared to have killed a number of people living in an area close to the city of Belo Horizonte, a local fire service official said. Emergency services were still responding to the situation in and around the town of Brumadinho — population 39,000 — and did not yet have a toll, the official told AFP. “According to accounts that we are receiving, there were several deaths,” the official said. President Jair Bolsonaro will visit the affected region on Saturday, a government spokesman said. Brazil’s environment minister, Ricardo Salles, was already on his way. Bolsonaro “regrets the possible loss of life” and was closely following the situation, the spokesman, Otavio Santana do Rego Barros, told reporters. Television images taken from the air showed a wide swath of devastation cut through vegetation and farmland. Several damaged homes could be seen, and some were destroyed, with nothing but their tiled roofs left sitting on mud. A rescue helicopter was seen hovering over two survivors trapped up to their waist in mud, with its crew trying to pull them to safety. An online video showed the moment the river of tons of mud cut across a road. Brumadinho is located 60 kilometers (40 miles) southwest of Belo Horizonte. Shares in Vale fell nearly 12 percent in New York before pulling back to around seven percent in the red by the middle of trading. The Sao Paulo stock market was closed today for a holiday. 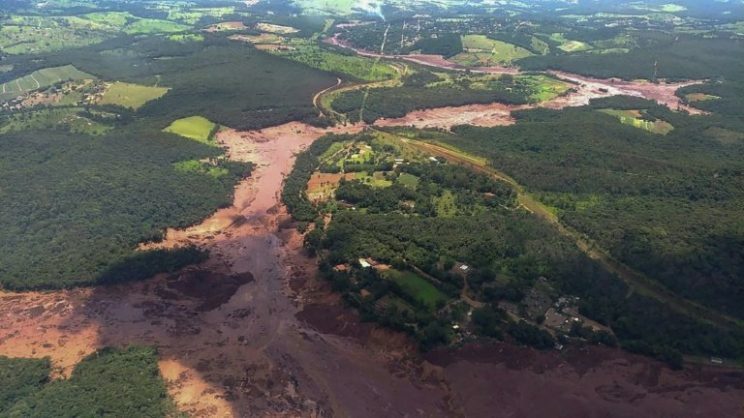 Today’s disaster recalled trauma from a 2015 dam break in a different part of the same state of Minas Gerais, in Mariana, in which 19 people died. That accident three years ago released millions of tons of toxic iron waste along hundreds of kilometers (miles), causing what was considered the country’s worst environmental disaster. Vale was joint operator of the dam, along with the Anglo-Australian group BHP. An emergency team from the Ibama environmental protection agency had been dispatched to the zone impacted by today’s dam collapse to determine the damage, Salles told the G1 news website. The agency estimated that the collapse had released a million tons of water and mud, according to the Estadao newspaper.